Prochem Pinch Valves provide a simple on/off or control valve for chemicals, slurries and powders with their straight through design. They can also be used as Pressure Relief or Pressure Loading Valves on dosing systems handling slurries such as Lime. The Series 2100 suction demand valve (SDV) is designed to hydraulically isolate a metering pump from its bulk supply tank to prevent variations in suction pressure and hence pump accuracy due to rising and falling tank liquid levels. Prochem 'CALIPOTS' are used to confirm correct dosing rates from system dosing pumps. The calipot is normally filled to a set level and the dosing pumps then fed from it for a pre-set period - usually 1 minute. The pumping rate is then checked against the time-calculated flow rate. Prochem Pulsation Dampers are designed to remove the pulsing flow pattern produced by reciprocating dosing pumps. They offer a reliable means of stabilising flows and pressures in dosing systems and reduce pipework vibration. 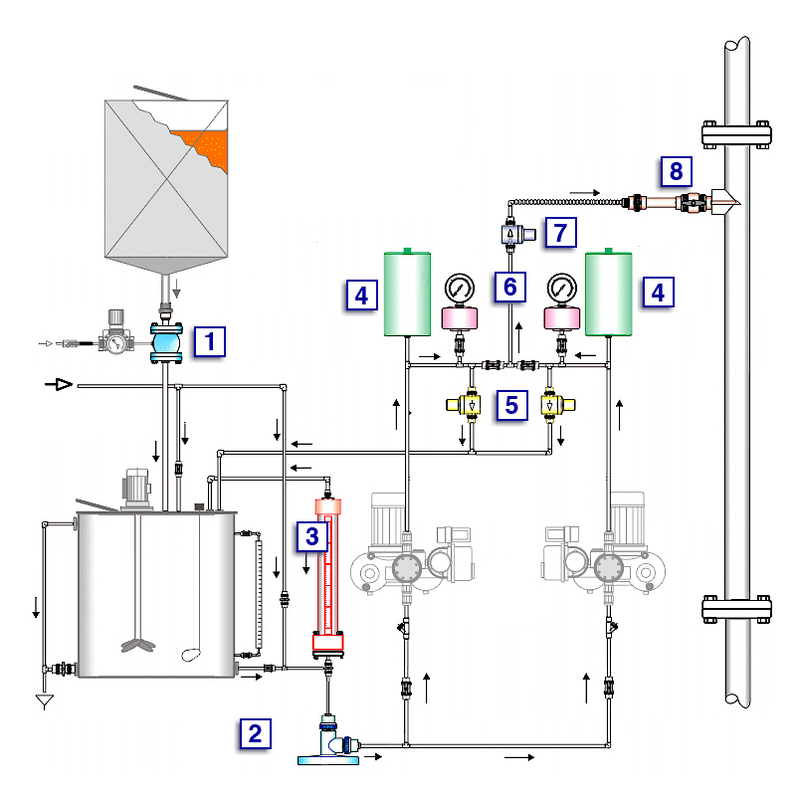 Prochem Pressure Relief Valves (PRV) are designed to prevent overpressure in dosing systems. They protect the pump and system from overload and personnel from potentially dangerous chemical pipe rupture. Prochem diaphragm seals (or gauge isolators) are designed to enable standard construction pressure gauges and switches to be used on process lines carrying corrosive chemicals or slurries which would otherwise corrode or clog the sensing. Prochem Pressure Loading Valves (PLV) are designed to present dosing pumps with a constant discharge pressure and thus provide an accurate discharge flow. Withdrawable injection fittings (W.I.F.) are generally used within dosing systems and are the means of introducing chemicals into main pipeline streams and the sample lances are used to extract samples for quality monitoring.